The Archdiocese of Milwaukee operates seven mausoleums comprising of over 60,000 crypts and niches. (Click here for in-depth information about placing regarding cremated remains in niches.) Our mausoleums are built using construction materials and engineering principles that insure permanence. There are inside climate-controlled crypt areas with nearby chapels, religious art (statuary, mosaics, paintings and stained-glass windows) and meditation areas. There are outside crypt areas in malls, patios and courtyards with beautiful gardens consisting of perennial and seasonal plantings and sacred shrines with religious statuary. 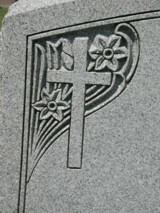 In the unfortunate event of vandalism, unlike a personal marker, monument or vase used to memorialize an in-ground burial, the insurance carriers of the Archdiocese of Milwaukee cover crypt memorialization items placed to memorialize an above-ground entombment. We have eight different cemeteries each with many crypt locations and options, you can inquire about mausoleum entombment or initiate a purchase of a crypt by calling or visiting any of our cemeteries to talk with a Family Service Counselor. You can request more information here. However you approach us, we wish to make a full disclosure of all your options and their costs.